Across the myriad of interwebs, i’ve seen a lot of comments from people wondering “just how frakkin’ big was the Colony?” Truth be told, there may not be an exact figure. See, Lightwave tends to choke if you expand the world into krazy amounts of kilometers. The software still works, but it can get a little buggy on you when things get too big, so the CG model of the Cylon Colony was built to a scale far larger than the Galactica, but not quite as big as FX Supervisor Gary Hutzel imagined. For the final shots, the size of ships next to The Colony had to be squeezed down to match his vision of the true enormity of the bad guys’ ultimate secret lair. But don’t fret, here are a few images to give you the general idea, so click through for some high tech BSG action! I’m sure this post is going to lead to a million more questions about this fine ship/Cylon homeworld, but I ask you to bite your tongues for now – there will be more to come in the not too distant future. I thought it was just my less than amazing hardware at fault when Lightwave choked after trying to render a scene with Earth, the moon and some stuff in LEO, all at actual scale and distance! That’s all that was missing, a book with the corners missing with “Don’t Panic” written on in large, friendly letters! Great to have you back! Hope you continue to feel better every day. Thanks for the info. Note that the Colony is about twice as wide in the top view (60km) as it is in the side view (30km). I was using Lee Stringer’s 1438.64m for Galactica’s length, which was measured from the actual LightWave model. Too cool, thanx very much. Seems to me that, besides looking disease ridden, the Colony was the most organic of any Cylon creation. Hurts my brain thinking about it compared to a Death Star. It’s huge! But it was so fragile, when it got hit by the nukes. To tell the truth, I thought it was bigger. You can’t tell when the ship jumps in, but after the nuke hits, there’s a push in where Galactica is looking very tiny indeed next to one of the colony’s arms. She’s nestled easily in between two little outcroppings that you can barely see on the diagram. It’s not a moon, it’s a fraking toaster colony! Hey thanks for sharing its shape and size!With these pics I can start to model my own colony!Did you make it look like the phoenix thats on the colonial seal on purpose? Because from the side view it looks alot like it. Since its not a sphere like the death star it wont be the same size. But the diameter seems to be a similar radius. Mabey a bit smaller but still close.Can some one make a size chart comparing the death star and the colony? I want to see how it measures up just for fun. The geek approcal factor just get’s bigger eveyday and finds its way into every aspect of our lives. Great to have you back. Speaking of backs, I hope yours is mending nicely. Also are you gonna be posting any rendered front and side views to show details like colors and guns? Great job, send my thanks to the team(s) for doing a great job on vfx!! OBSIDIAN – Nope, the poster image for this entry was found on the web through a Google image search. Kudos to the person I stole it from. BORIS – Go outside and get some fresh air! DAN – You got me, I had nothing to do with the shots of the Galactica and Colony facing off. I’ll see if any of the guys want to mark the spot! FILIPE – The nukes were never supposed to (or be able to) destroy the Colony – they were simply meant to provide enough force to knock the Colony out of it’s precarious orbit around the black hole and INTO the black hole. That’s how it was written, but in the final show it didn’t quite come across clearly. MIKE: It might be bigger, as I said I was trying to give everyone a rough idea. Also keep in mind that the choice of camera lens for a given shot can GREATLY exaggerate the perception of scale. CHURCH – Thanks for the kind words, it’s now been almost a week since the surgery and I’m slowly starting to feel normal again. I’ve been sitting in front of the computer now for about half an hour and I’m only JUST beginning to feel like it’s time to quit. Not bad! JACK – Pierre Drolet, who built the Colony model, thanks you. Thanks Mojo! When I saw little snippets of the Colony I noticed some ribbing on it that gave me this initial flash of horror “OMG, it’s made up of *battlestars*. Until the Daybreak part II and more of the Colony was revealed, I was really afraid that “all of this has happened before, and will happen again”, but how many times before had it happened? Temporal loop? Aieeeee! My fears were unfounded, thank Muffet! Thanks to you and everyone else that breathed life into Galactica. One the hallmarks of a good story is how long after the tale people talk about it. The old girl is gonna have legs for years! Any renderer that uses single precision (32-bit) floating point for geometry will have problems when trying to render human sized objects at astronomical scales. This is a problem for NASA when we try to render correctly scaled satellites orbiting a correctly scaled Earth. For the most part, we follow Hollywood’s lead and cheat. I first ran into this problem a dozen years ago when I tried to do some renderings of Niven’s Ringworld. At single precision, you can’t really get close to the surface. You’re either way above it or way below it. I suppose I could recompile one of the open source renderers to use double precision, but I’ve never gotten around to it. I think centurion005 would love to have some actual rendered shots of the Colony. Now I have a question which you might not be able to answer at all citing your note that you weren’t involved with the Colony shots… but here goes. 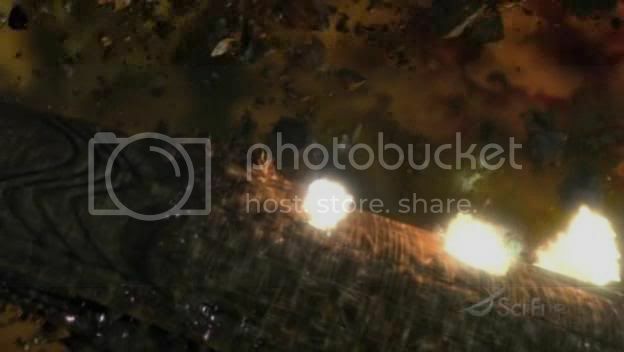 The overhead shot of the nukes approaching the colony (right after the dead Racetrack bumps the button) seems highly remniscent of the scene in the Miniseries where the fledgling Ragtag Fleet has to leave behind Non-FTL ships – right as they leave Raiders jump in and launch a fan of missiles. Both scenes seem so strikingly similar that I’m curios whether this was intentional or not.. any idea? This is what I mean by rendered shots. http://www.shipschematics.net/bsg/images/colonial/battlestar_galactica.jpg Something like that but with the colony. One last question. Do you think that you would consider doing some extra scenes for the Season4 dvd that shows the colony imploding/exploding? Mabey even a few extra shots of vipers fighting the old style raiders since they did have them in the colony.Just as a special extra treat? Thanks for the rough comparison pics, Mojo. Although what I really liked from the episodes was where we could see basestars being dwarfed in front of the Colony. To think they in turn dwarf most other ships we’ve seen (aside from the battlestars) boggles the mind. Darthmojo id thought id share this with you. Its a render I did of a fan made centurion model I found. I tried to get the metal material as close as I could to what it looks like in the show.The model I used isnt as good as yours obviously as there are some seems shown.I did the eye myself which I thought was a little mishapen. All and all I thought it turned out ok but far from great.Mabey with a bit of custom editing of the model and tweaking of the eye I can get and almost mirrored look to the cylon models you use on the show.Thought id share it and would like to know what you think. WOW. That is HUGE. Its got this awesome shape too…kinda like the bottom is growing a Basestar. That’s one awesome model, are you going to be posting an rendered shots of it? Good luck on the back recovery btw! Hate to spoil the frak fest…but as huge as the Colony was, it still pales in comparison to the 160km diameter Death Star. 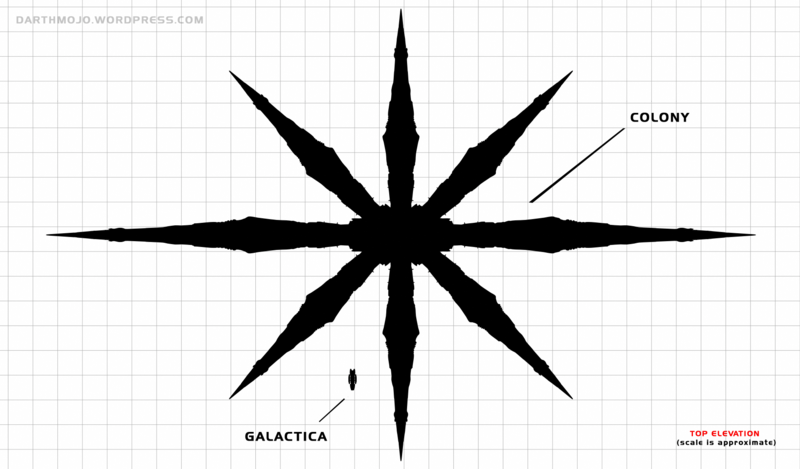 The Galactica-Science blogs did a size comparison on the Colony using the basestars floating in front of it in Islanded and Daybreak I for size comparisons, which is where the “Bigger than the Death Star!” stuff came from. That suggested a size of 150km just from the tip of the arms to the core, so maybe 300km in total diameter, or over twice the width of the Death Star. However, that is a bit silly :-) The size as shown here is far saner and better reflects the idea that the Colony was originally a small space station built around the Final Five’s ship and the Cylons have been adding to it and expanding it for the forty years since then non-stop. Tech junkies, start your engines! Thanks — are those the absolutely exact LightWave figures? Intersting things to be sure. Building the colony for 40+ years hmmm. Never thought about that one I would have expected to see some form of shipyard/ mining station somewhere nearby. I often wonder what the Cylons did for entertainment, you know all work and no play.. Guess it’s building and destroying. Though the thought of Cylons having movies etc seems funny to me. Cylons love the Terminator series because it’s so true to life. The only surviving movie onboard Galactica was and old copy of “That Darn Daggit” sorry my mind was way way off in left tangent field.. 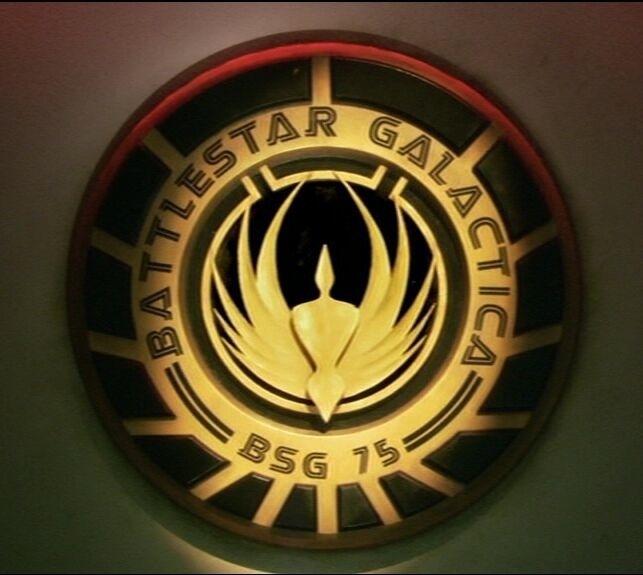 Ever notice that the Cylons tend to build things in symetrical patterns or repeating patterns. For that matter alot of stuff is built symetrically it would be refreshing to see something that is not done in that fashion. Something that is just a hodge podge of random shapes and jutting structures for no apparent rhyme or reason. Don’t get me wrong the colony looks cool and is wonderfully done. A visual delight to be sure. The same for the rest of the modeling and cgi fx that were done. But wouldn’t it be cool to see some non-traditional styles created and used. At least in space sequences that is. I don’t know but alot of times things look like they are designed more for aerodynamic travel rather than space travel. I can understand the ships that would be able to make a planet landing like the Vipers and the Raiders and smaller transport ships but the bigger ships, anyhow like I said my minds wandering alot this morning. Thanks for the size information! I have no idea what I’m going to do with it, but its nice to know for sure! How do you guys determine model scale in production? Is it decided before modeling begins, or is the ship modeled, and then scaled to whatever the supervisors want? Also, do you guys still do a Scene master and then breakouts for every shot? The ones with this colony looked like they had thousands of objects over a really wide scale range. Has this ever broken Lightwave at all? So Galactica is just under a mile, and the Pegasus is just over a mile. I think the “twice the size of Galactica” comment by Cain was reffering to the double flight pods. Any ideas on the exact size of a Basestar or the Resurrection ship and Hub? Colonial Warrior the cylons have that projcetion which is sorta like a matrix virtual world which they can control and are aware of.That is one form of there entertainment. Another thing they do for fun is stand upside down on there heads naked. Also the colony is probably like the mothership from independence day.Meaning they build all there ships inside it. Someone made a stupid rookie mistake. The second image is nearly twice as big as the first image of the colony. That or the Galactica is incorrectly portrayed in one of them. Oh yeah and Filipe Freitas, the reason it was “so fragile when it was hit by nukes” was because it was in orbit around the black hole. The structure itself was probably very strong but once blown out of orbit it just fell into the black hole… and gods know what happened after that! This was also the reason the Galactica broke it’s back after jumping because the gravity pull of the black hole’s force being released after the jump was like a slingshot to it’s entire structure. Yup, Galactica is fairly sleek whilst Pegasus is much boxier and ‘taller’ than Galactica. It also looks a lot wider. That’s where the extra space would come from. That was always my take on it. 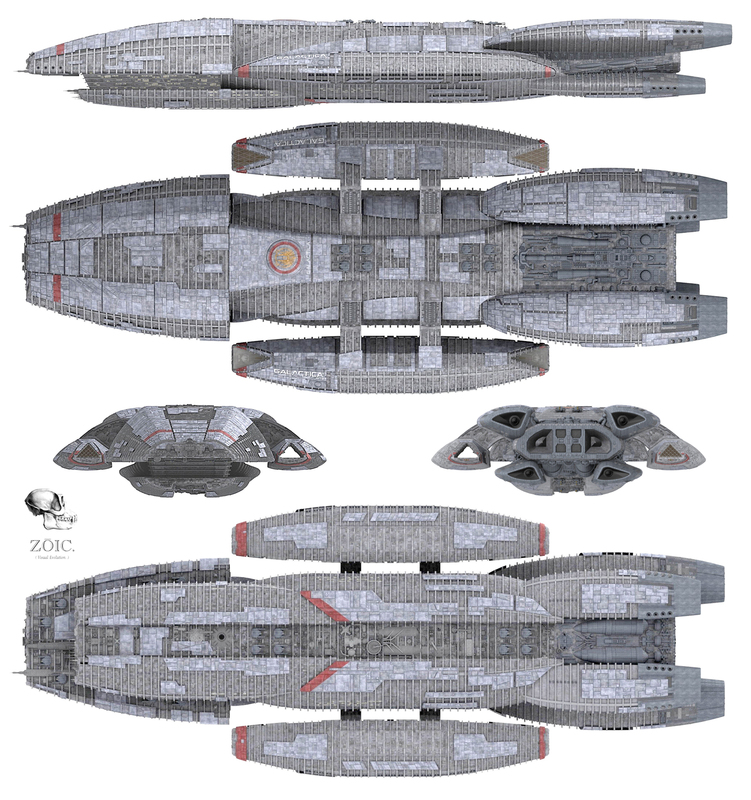 A while back I took the dimensions of both ships and checked the ratio between Galactica and Pegasus’s length, width and height. I know it’s not going to be exact, because their shapes are different, but they’re similar enough to make it work roughly. any word on pegasus’s weapons info? and Valkyrie. love the Valkyrie! To darthmojo: Hey, do you know the width and height of the Pegasus? Oh and do you have any idea about how large the Pegasus’s flight pods are? Any one else notice how the colony looks a lot like a shadow ship from B5? We take a CD and place a dot on it with a Sharpie pen. That dot represents our planet, the cd our solar system. Now imagine the rest of the planet in relation to this CD. That is our galaxy. One of billions in the universe which is constantly expanding. Now that’s big. According to the scale from the images, the Colony is 26,732.5 meters across, assuming Galactica is 1445 meters (4,740 ft) long, which seems to be canon.